Stone Street Capital Reviews - Is it a Scam or Legit? Stone Street Capital provides clients with one-time, lump-sum payments for lawsuit settlements, lottery winnings and annuities normally paid out over time. If you’re looking for a way to convert your settlement, lottery winnings or annuity into a lump-sum payment, there’s a good chance you’ll come across Stone Street Capital. The Maryland-based company offers structured settlements to its clients, helping them cash in monthly pay-outs. Is it worth it to use a company like Stone Street Capital to get a lump for a cash amount that would normally be paid out over a several years? We wanted to know the answer to this question, so we researched the company to find out what they offer and how they do what they do. Over the next few minutes, we’ll take a look at who Stone Street Capital (SSC) is and what they offer, whether or not structured settlements are smart, what other people are saying about SSC and, finally, our conclusions about what we found. Once you’re done here, we think you’ll benefit from reading our guide to structured settlements. Check it out of you want to get more information about advantages, disadvantages and when you should sell your settlement. Who is Stone Street Capital and What Do They Do? Stone Street is a limited-liability corporation based in Bethesda, Maryland. It has been in business since 1989 and has been registered with the Better Business Bureau since 1996. According to the company’s Linkedin page, they have between 51 and 200 employees. The company’s goal is to negotiate a “structured settlement”. For example, you win $1 million and decide to receive the total over a certain amount of years through regular payments (more on that in a few minutes). An emergency happens and you need $300,000 to cover medical bills. Your lottery payments aren’t enough to cover the bills, so you ask Stone Street to help. Stone Street goes to the lottery organization and offers to buy out the rest of your payments. If they get the green light, they come to you with terms for the lump sum. This amount is less than what’s actually left on your payments because Stone Street (like all businesses of this type) takes their cut in the form of fees and a “discount rate,” which is a percentage they charge you for their services. These percentages are based on the type of payments you receive and the dollar value of your remaining payments. Is it a Good Idea to Get a Lump Sum Instead of Weekly or Monthly Payments? Let’s answer this question in the context of the lottery. Say you win $1 million. Do you choose to have the money paid out all at once, or in small intervals across annual payments? There are dozens of sad stories of how people who chose the lottery lump sum ended up bankrupt and in the same – or worse – financial position they were in previous to their jackpot. Now, let’s assume you’re financially responsible and will invest your lump sum. The math is pretty clear in this situation: taking a lump sum up front and investing it will, if invested in a sensible way, double your sum over the course of thirty years. So, take the lump sum Stone Street is offering, right? Well, it’s not that easy. Why? Because Stone Street charges you the fees and discount rate we talked about earlier. For example, you’ve got $120,000 left in payments to be paid out over 10 years. You want a lump sum. If Stone Street takes a 4% discount rate, you’ll get a lump sum payment (fees not included) of $94,600. If they take 10%, you’ll get 76,200. At 15%, you’ll get $62,590. We emailed with a Stone Street representative who told us the company’s discount rates (also known as buy rates) range from 6% to 20%. These fees are pretty steep. Another factor to consider is the time a structured settlement payment takes. In order for you to get your payment, you’ll need to set a court date in order for a judge to review the terms of your lump-sum payment to verify if they’re fair or not. Once he or she reaches his decision, you’ll have to wait another two to four weeks to get your money, according to the Stone Street website. Though the company touts their ability to get you your cash quickly, this article by CreditCards.com points out that “fast” usually means between 45-60 days. Based on what we’ve found, we think you should only enter into a lump-sum agreement with Stone Street if you absolutely need the money, or you’re not too concerned about losing a chunk of your balance to Stone Street’s fees. What are Other People Saying About Stone Street? The company has an A+ Better Business Bureau ranking. Over the past three years, SSC has resolved 47 complaints filed through the BBB. We noticed several complaints about how the company makes repeated phone calls to consumers. When we talked with SSC through their customer-service chat client, they asked us for our phone number. However, we insisted on receiving information by email. If you want to find out more information about SSC without being hounded by phone calls, we suggest doing the same. We wanted more information about SSC’s ratings, so we investigated the site’s “five-star rating” from TopConsumerReviews.com. They received a 5-star rating, but the rating isn’t based on actual feedback from consumers. The rating comes from an independent, paid reviewer who, based on our research, pulled info from SSC’s website and its BBB page to determine the site’s star rating. The thin research and non-consumer generated ranking lead us to believe their five-star rating isn’t substantial enough to help you decide if you want to use SSC. Stone Street received a 2.7 star-rating from 12 reviews on Sellmyannuity.net. 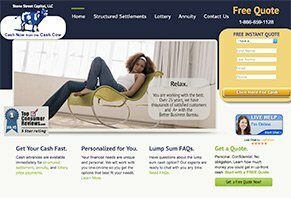 SSC’s website makes it seem like structured settlements are a great way to buy cars, homes, send your kids to college or buy “something else important” to you. We believe this is deceptive because the key to SSC’s business is making money off your settlements through the 6% to 20% buy rates they charge you. So, in our opinion, it benefits them financially to convince you to use your remaining settlement to pay for everyday things. While we can’t say that structured settlements are completely bad, we do feel like our research shows that you should speak with a trusted financial advisor before cashing out your settlement, lottery winnings or other annuity. Your advisor is qualified to look at your financial situation and suggest the best course of action. We think the money you’ll pay him or her for a consultation could save you the tens of thousands of dollars you’d lose if you chose to take an SSC lump sum. Even though research we’ve done leads us to believe using SSC may not be the best financial choice, we do know that living with debt or sudden income loss can be really stressful. You may want a quick fix to alleviate your debt (and stress), but that isn’t always the best solution. Creating an overview of your financial situation, making a budget and mapping out a step-by-step plan are three important parts of paying off your debt. If it’s student loans that are weighing you down, learn why consolidating your loans and exploring loan-forgiveness programs can boost your repayment efforts. Write a Review for Stone Street Capital!